As already described, User Passwords can be assigned. 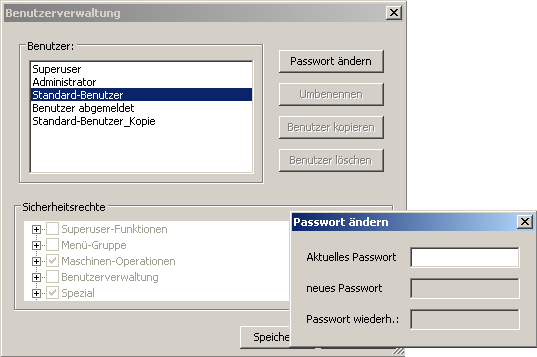 After selecting the current user, the „Change Password“ button is activated. Pressing this button opens a small dialogue box which allows the user to enter a password. Both entries must be identical. All numerals, letters and special characters may be used and the password may be between 0 and 225 characters long. That means that the field may also be left empty, i.e. that no password is assigned. If there are several users using one machine, it may be sensible not to assign a password, so that they do not all have to log in each time they change user. However, if other people also have access to the machine, it might make sense to block access for them, to prevent any accidents. Attention! Be careful not to forget the password. If this however still does happen, only an Administrator can reassign the password. If this is required, or other adjustments must be made to the machine’s settings, please contact the Support Department at CNC-Step e.K.